This is a sample nylon Type 1775 fiber from the sample-set provided by Textile Fabric Consultants, Inc. Nylon Type 1775 is a trademarked product of the Monsanto Chemical Company. 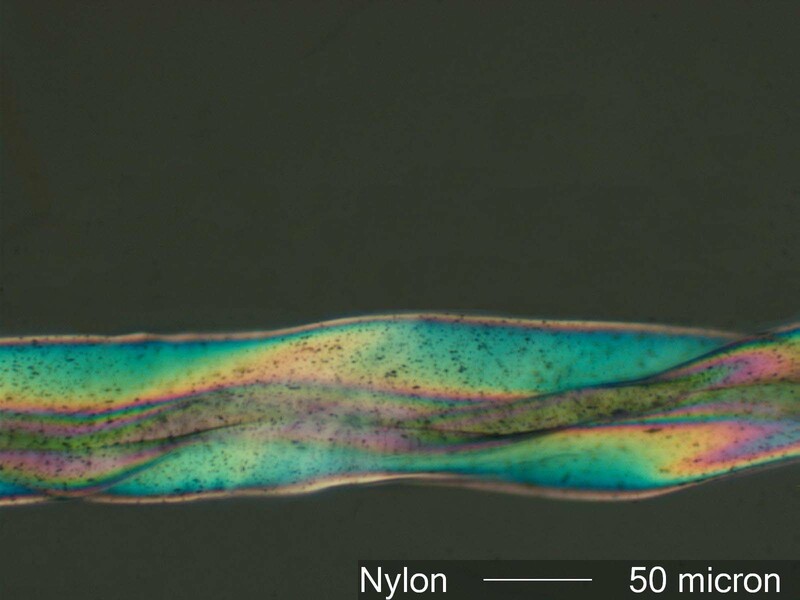 The moderate birefringence and irregular cross-section (trilobate) of the fiber results in the third to forth order interference colors seen here. Rayon fiber has a refractive index along its length of about 1.57 to 1.59 and perpendicular to its length of about 1.51 to 1.53. It has a birefringence of about 0.06 and a positive sign of elongation. It tends to exhibit a smooth, regular surface along its length depending on its cross-section of the fiber. Extreme shapes, such as the trilobate Type 1775, can result in an irregular appearance along the length as the fiber twists or bends.